Thinking about migrating over to WordPress or been on it for a little bit (I’m just hitting my two year mark myself!) but still curious and/or have questions you can’t seem to find the answers to? As a web designer who works with WordPress on a day to day basis, I get a lot of questions regarding the platform. I wanted to put together a list of things everyone should know about WordPress to read before they switched or something to educated themselves while still learning the new host to your site. I myself am learning every day more and more about WordPress, so I’m no expert, but these 6 things are the most important aspects I’ve learned about being and having a site on WordPress. Wanna learn more about wordpress? Pin it to save! WordPress.com is as similar to Blogger as it can be, but it’s using WordPress as it’s frame. It’s free and you can simply sign up and begin to setup a blog/site similar to Blogspot’s platform. As with Blogger, there are limitations to what it may look like, the widgets/plugins you can use, and overall the sense of ownership of it. WordPress.org is similar to owning an actual website. You purchase hosting (online storage) for your site, hook your domain (.com) to it, and install the free WordPress framework onto your hosting. From there, you pretty much have free control of everything your site does, look, feels, and acts. There are 1,000s of plugins to choose from (free and paid) that will help enhance your site alongside a ton of themes to browse and setup. These themes can be customizable to exactly what you want your website to be and act for your potential readers. You can hire someone like me to help you setup your self-hosted WordPress, customize the theme, and get your site up and running with branding in mind. Are you still confused? Don’t worry, you’re not the only one! Just remember, with WordPress.org (the self-hosted version) your options for your site are endless! Speaking with self-hosted in mind, WordPress can be so much more than just a blog. You can run a shop directly on your site, receive payment, send automatic downloads, all through your WordPress dashboard. I personally use WooCommerce for my site and any sites I setup for my clients. It’s straight forward and easy to use! You can also host a private membership site through your WP and create a resource library for readers to download freebies. I mentioned this above a little bit but a self-hosted WordPress does require hosting and a domain. This is basically your web address and where your site will be stored online (think Google Drive but for your website). If you have already purchased a domain from somewhere else, it’s no problem to hook it up to a hosting account. It can even be transferred to your hosting account later on if you would like your bill all in one place. As far as hosting goes, there are amazing options out there like BlueHost, SiteGround, HostGator, or my personal hosting TechSurgeons, which offers amazing 1:1 customer service. 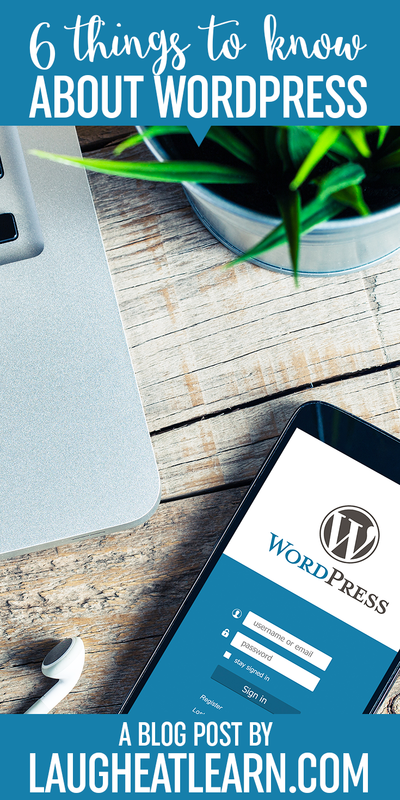 Once you have a domain and hosting purchased, it’s a simple as installing the WordPress platform (your host can even do it for you) onto your new site! This option comes standard with all of my WordPress packages, including any support you may need getting the above figured out. If you have heard the term SEO (Search Engine Optimization), you would have probably heard that WordPress is ideal for the best and most control on SEO. There are many plugins out there that will help set this up for you but my favorite is YoastSEO. It’s completely free (but you can upgrade if you want the pro option) and easy to use. You simply install the plugin, run through the setup wizard, and begin to add the require content. 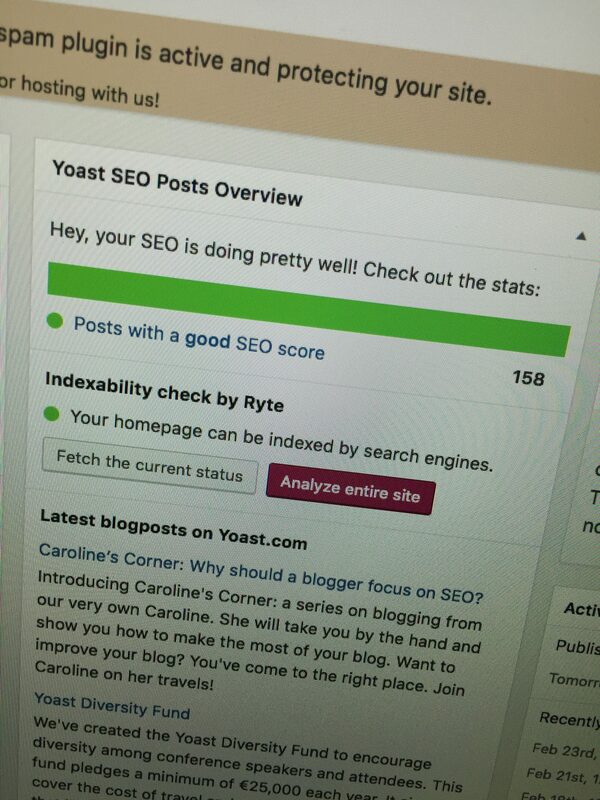 This plugin is visually in the sense it will give each blog post and page of your website a red, yellow, orange, or green light for your progress on getting it SEO ready. This applies to your content of the post and your selected keyword (which is similar to keywords readers search for). The best part is at the bottom of your editing screen it will give you tips on how to improve your score to get all green lights, the ultimate goal. Now, getting your content ready and green lights does take some work. You do have to edit each post to make sure you have a keyword set and a meta description (search engine line) set. From there you may edit your post or follow the improvements they suggest to better the score you get. I’ve been on WordPress for about 2 years and finally just got all green lights on my posts! It took some time, but it’s worth it for sure! I could go on forever on all the amazing plugins out there, but you can simply search here (for ANYTHING). This is probably the best thing about moving to WordPress. I can literally have a plugin that keeps track of my popular posts, a recipe formatting plugin, and one that keeps a calendar of my posts and upcoming posts. I have my newsletter directly connected to my site and can see up to the minute analytics upon logging into my personal dashboard. In all seriousness, you want to protect your website by all means necessary. Good thing for us, there are tons of plugins (see I told you) out there that can help with this. For starters, if you don’t already, you’ll want to download and sign up for JetPack (this will require you to signup using a WORDPRESS.COM account but you can make it the same login as your self-hosted and click out of it when it asks you what plan you want.) With Jetpack, comes the ability to sign up for Akismet Anti-Spam for free. This will help protect you against all that stupid spam you will start getting after setting up your site (trust me). Make sure to setup a plugin that limits or adds captcha to your login form for your website that way it blocks unwanted users. Make sure to never give out your personal password, but rather add users to your account if they need access to your site. You can read more directions here in this blog post about Blogging. Lastly, you’ll also want to either confirm or purchase/find a backup plan. Some hosting companies include this in your hosting deal, so double check in that case. You’ll want to run a backup anytime you update your plugins/site and/or at least once a month.